Shuttle managers met today to review tests and inspections of suspect hydrogen flow control valves and agreed enough progress had been made to justify another flight readiness review Friday and a March 11 target launch date for the shuttle Discovery's delayed space station assembly mission. "The space shuttle program moved the targeted launch a day earlier following extensive review of flow control valve inspection data and assessment of ongoing and planned work," NASA said in a brief statement. "A formal presentation of the flow control work and a thorough review of all aspects of flight will be made at Friday's readiness review." The unanimous decision to press ahead with a third FRR Friday came after a full day of discussions aimed at developing an acceptable rationale for launching Discovery with flow control valves that are susceptible to fatigue-induced cracks. An engineering photograph shows the cracked valve poppet removed from shuttle Endeavour after STS-126, which launched last November. Photo: NASA. The valves are used to keep the hydrogen section of the shuttle's external tank pressurized during the climb to space. 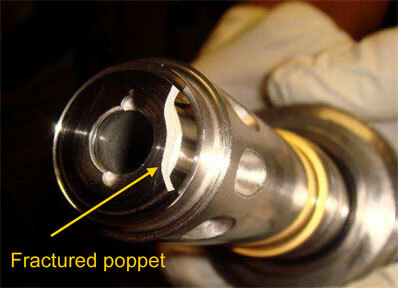 During the most recent shuttle flight last November, a piece of one valve poppet broke free. It was the first such incident in shuttle history and while it caused no problems during the November ascent, NASA managers ordered tests to assess the safety of the system. Thanks to the successful use of an alternative eddy current inspection technique, engineers are confident valves installed aboard Discovery this week are crack free. They also are confident, based on extensive testing and analysis, that a crack cannot develop and propagate to failure in a single flight. Other factors in today's decision included analyses showing multiple valve failures with debris releases larger than the one previous in-flight incident would be required to produce tank over-pressurization and dangerous hydrogen venting during the first two minutes of flight. Conversely, to underpressurize the tank, a larger leak would be required than impact testing showed was reasonable. Finally, a leak that would release enough hydrogen into the shuttle's aft engine compartment to cause a problem would require a "significant" rupture in the pressurization line, which orbiter engineers concluded was unlikely. Even so, engineers developed a plan earlier to install braces, or doublers, on 90-degree bends in the pressurization lines just 5 inches from the valves to protect against the possibility of an unexpected valve failure that could shoot high-velocity debris down the line. But during today's meeting, engineers concluded the doubler would not be ready in time and that given the inspections and analysis of the valves aboard Discovery, the shuttle could be safely launched as is. But shuttle managers did not rule out using the doublers for downstream flights. Going into today's meeting, NASA sources said a decision to proceed to an FRR Friday would mean strong support for a formal decision to proceed with launch. After two previous readiness reviews, managers were reluctant to fly to Florida again if there was serious doubt about the outcome. On the assumption a March 11 launch will, in fact, be approved Friday, Discovery's seven-member crew - commander Lee Archambault, pilot Dominic "Tony" Antonelli, John Phillips, Japanese astronaut Koichi Wakata and spacewalkers Steve Swanson, Richard Arnold and Joseph Acaba - planned to begin a standard week-long medical quarantine this evening. For a launch on March 11, the astronauts would fly to the Kennedy Space Center Sunday afternoon and the countdown would begin at 7 p.m. that evening. Launch of the 125th shuttle mission would be targeted for 9:20 p.m. next Wednesday. Assuming an on-time liftoff, Discovery would dock with the international space station at 6:27 p.m. Friday, March 13. Four spacewalks are planned, on March 15, 17, 19 and 21, starting between 2:50 p.m. and 12:50 p.m. Undocking would be targeted for around 10:23 a.m. on March 23, with landing back at the Kennedy Space Center expected around 3:27 p.m. on March 25. See the March 3 update for additional details on the flow control valve issue. An updated flight plan, countdown and ascent timeline will be posted as soon as possible.